High in normal (HIN)-1 is a secreted protein highly expressed in normal breast epithelium and down-regulated in breast carcinomas. By searching GenBank expressed sequence tag databases, we identified HIN-2, a protein homologous to HIN-1. HIN-2 is identical with a recently identified protein called uteroglobin-related protein 1 (UGRP1). Northern blot analysis demonstrated that UGRP1 is specifically expressed by lung, but not by the other tissues examined. 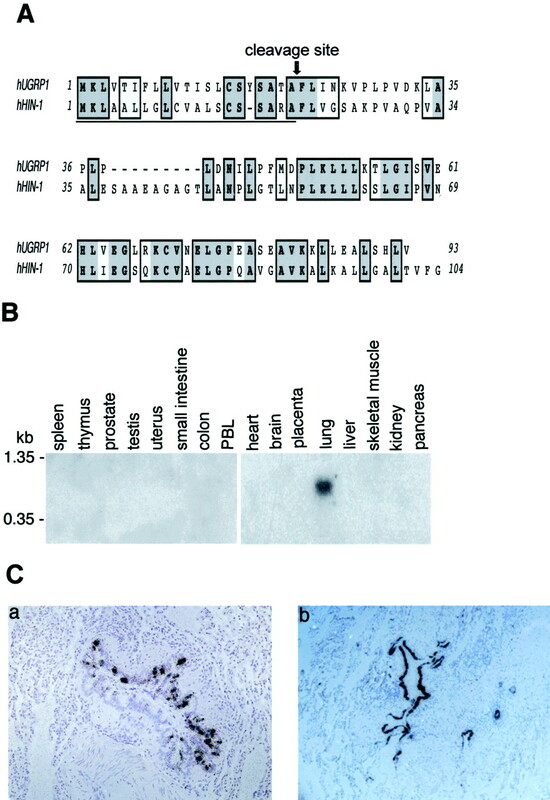 By in situ hybridization experiments, UGRP1 was shown to be expressed by lung Clara-like cells in the bronchial epithelium and to be up-regulated in cystic fibrosis. In a mammalian expression system, secreted recombinant UGRP1 was copurified with apolipoprotein A-I. Using a retroviral vector-mediated expression cloning approach, we identified macrophage scavenger receptor with collagenous structure (MARCO) as a receptor for UGRP1. Northern blot and in situ hybridization experiments indicated that MARCO is expressed by alveolar macrophages in the lung. UGRP1 also bound to bacteria and yeast. LPS, a previously identified MARCO ligand, competed with UGRP1 for binding to MARCO and bacteria. Our findings suggest that UGRP1-MARCO is a ligand-receptor pair that is probably involved in inflammation and pathogen clearance in the lung. High in normal (HIN)3-1 is a secreted protein highly expressed in normal human breast epithelium but is significantly down-regulated in most breast carcinomas and preinvasive lesions (1). The promoter of the HIN-1 gene is hypermethylated in the majority of breast cancer cell lines (1). Because reintroduction of HIN-1 into breast cancer cells inhibits cell growth, HIN-1 has been suggested to be a candidate tumor suppressor (1). HIN-1 has no significant homology with any known cytokines or growth factors, and its biological functions and action mechanisms remain unknown (1). We reasoned that HIN-1 could be a prototypic member of a novel family of secreted proteins. We searched the expressed sequence tag (EST) databases for novel molecules homologous to HIN-1. This effort identified a protein designated as HIN-2. While this work was in progress, a protein identical with HIN-2, called uteroglobin-related protein 1 (UGRP1), was identified (2, 3). UGRP1 was identified in a suppressive-subtractive hybridization experiment using lung mRNAs from normal and TTF-1 (also called NKX2.1 and T/EBP) knockout mice (2). TTF-1 is a homeodomain-containing transcription factor that is critically involved in thyroid- and lung-specific expression of genes, such as the thyroid-specific thyroglobin, thyroid peroxidase, and thyroid-stimulating hormone receptor, and the lung-specific surfactant proteins-A, -B, and -C (4, 5, 6, 7, 8, 9, 10). Targeted disruption of the TTF-1 gene results in a deficiency of the thyroid and pituitary glands and the immediate postnatal death of the knockout mice due to respiratory failure caused by severe hypoplastic lungs (11). These studies indicate critical roles for TTF-1 and its downstream genes in physiological and pathological processes of the lung, thyroid, and pituitary gland. In this paper, we describe the further characterization of HIN-2/UGRP1. Using an expression cloning approach, we also identified macrophage scavenger receptor with collagenous structure (MARCO) (12, 13, 14, 15, 16, 17) as a receptor for HIN-2/UGRP1. Our findings suggest that HIN-2/UGRP1 and MARCO are a novel ligand-receptor pair involved in lung inflammation and pathogen clearance in the lung. 293 and U937 (American Type Culture Collection, Manassas, VA), 292–10A1 (Imgenex, San Diego, CA), and lung cancer A549, H28, H157, H290, H322, H441, H460, and H661 cells (Colorado University Cancer Center, Denver, CO) were obtained. U937 cells were cultured in RPMI 1640 medium containing 10% FBS. All other cell lines were cultured in DMEM medium containing 10% FBS. The bacteria strains Listeria monocytogenes NP1.0 (Dr. T. Potter (National Jewish Medical and Research Center, Denver, CO)) and Pseudomonas aeruginosa (Dr. M. Vasil (University of Colorado Health Sciences Center, Denver, CO)) were provided. The anti-FLAG mAb was purchased from Sigma-Aldrich (St. Louis, MO). N-terminal FLAG-tagged soluble TALL-1 (sTALL-1-FLAG) was produced in 293 cells and purified by anti-FLAG Ab affinity columns as described previously (18). To construct the mammalian expression plasmid for FLAG-UGRP1, a cDNA fragment encoding full-length human UGRP1 was amplified from a UGRP1 EST clone by PCR with the following two primers: 5′-cggaattccccagataactgtca-3′ and 5′-acatctagacaccaagtgtgatagc-3′. To construct the mammalian expression plasmid for FLAG-HIN-1, a cDNA fragment encoding full-length human HIN-1 was amplified from a HIN-1 EST clone by PCR with the following two primers: 5-cggaattcccccgcgccatgaagctc-3′ and 5′-acatctagagccaaacactgtcagg-3′. The PCR products were digested with EcoRI and XbaI, and inserted into the EcoRI and XbaI sites of pRK-C-FLAG plasmid to make pRK-C-FLAG-UGRP1 and pRK-C-FLAG-HIN-1. To construct the mammalian expression plasmid for MARCO, a cDNA fragment encoding full-length human MARCO was amplified by PCR from a MARCO-expressing cell clone obtained from the expression cloning (see Results) and cloned into MSCV-IRES-GFP (provided by Dr. P. Marrack (National Jewish Medical and Research Center)) to make MSCV-MARCO-GFP. In situ hybridization was performed as previously described (19). Briefly, the lungs were fixed in freshly prepared 4% paraformaldehyde and embedded in paraffin. Radiolabeled sense and antisense riboprobes were transcribed with [33P]UTP from full-length cDNAs that were previously cloned into plasmid pGEM-T easy (Promega, Madison, WI). Sections were hybridized and processed as described previously (19). Transfection of 293 and 293–10A1 cells was performed with a standard calcium phosphate precipitation method (20). To detect UGRP1-FLAG expression, 293 cells (∼3 × 106) were transfected with 10 μg of pRK-C-FLAG-UGRP1 or an empty control plasmid. Twenty-four hours after transfection, 5 ml of cell culture medium was collected and lyophilized. The lyophilized powder was dissolved in 500 μl of 1× SDS-PAGE loading buffer. Ten microliters of the sample was fractionated by 15% SDS-PAGE gel, and Western blot analysis was performed with a monoclonal anti-FLAG Ab. To purify C-terminal FLAG-tagged UGRP1 (UGRP1-FLAG) or HIN-1 (HIN-1-FLAG), ∼2 liters of conditioned medium of 293 cells transfected with pRK-C-FLAG-UGRP1 or pRK-C-FLAG-HIN-1 were collected and supplemented with 10 mM Tris (pH 7.5) and 150 mM NaCl. The conditioned medium was loaded into a 2-ml anti-FLAG Ab affinity chromatography column (Sigma-Aldrich). The column was washed with 12 ml of TBS three times. The bound proteins were eluted with 100 μg/ml FLAG peptide (Sigma-Aldrich) and quantitated by SDS-PAGE and Coomassie blue staining. Two micrograms of the purified proteins were fractionated on SDS-PAGE, transferred onto polyvinylidene difluoride membrane in 1× CAPS buffer (10 mM CAPS (pH 11) and 10% methanol). The blot was stained with 0.1% Coomassie blue R-250 in 40% methanol/1% acetic acid for 1 min and then washed with water; the bands were subjected to N-terminal protein sequencing, which was performed by National Jewish Medical and Research Center protein sequencing core facility. Cells (∼1 × 106) were incubated with 100 ng of the purified UGRP1-FLAG or HIN-1-FLAG in 200 μl of staining buffer (PBS containing 2% FBS) at 4°C for 20 min, and then sequentially incubated with anti-FLAG mAb (1 μg/ml) and RPE-conjugated goat anti-mouse IgG (1/200 dilution) in staining buffer, each for 30 min. Cells were washed twice with staining buffer after each incubation. Cellular fluorescence was measured with a BD Biosciences (Mountain View, CA) FACScan flow cytometer. Human lung cDNA retroviral expression library was purchased from Stratagene (La Jolla, CA). This library contains 1.8 × 108 independent clones. Plasmid DNA (150 μg) prepared from the library was transfected into 293–10A1 packaging cells (∼5 × 107) by the standard calcium phosphate precipitation method. Recombinant retroviruses released into the culture medium were harvested 48 h after transfection and used to infect U937 cells (∼5 × 107) in the presence of polybrene (8 μg/ml). Two days after infection, the cells were incubated with FLAG-UGRP1 (1 μg/ml) in staining buffer for 30 min and then panned with goat anti-mouse IgG microbeads (Miltenyi Biotec, Bergisch Gladbach, Germany) in degassed buffer (1× PBS plus 2 mg/ml BSA). UGRP1-FLAG-staining positive cells were isolated by MiniMACS separation column (Miltenyi Biotec) following procedures suggested by the manufacturer. The isolated cells were amplified and subjected to another round of UGRP1-FLAG staining and MiniMACS separation. The isolated cells were confirmed for UGRP1-FLAG binding by flow cytometry. Total RNA from these cells was prepared using the TRIzol (Invitrogen, Carlsbad, CA) method. Reverse transcription was then performed using the Script RT II kit (Invitrogen, Carlsbad, CA). cDNA inserts were amplified by PCR with the pFB retroviral vector primers, 5′-ggctgccgaccccgggggtgg-3′ and 5′-cgaaccccagagtcccgctca-3′. The amplified cDNA fragments were subcloned into the TA vector (Promega) and sequenced. Total RNA from the lung cancer cell lines and peripheral blood T cells and monocytes was prepared using the TRIzol method, fractionated in 1.2% agarose gels, and transferred to nitrocellulose membranes. Human multiple tissue RNA blots were purchased from Clontech (Palo Alto, CA). The blots were also hybridized under highly stringent conditions with [32P]cDNA probes corresponding to human UGRP1 or MARCO coding sequences. Bacteria strains L. monocytogenes NP1.0 and P. aeruginosa were grown in Luria-Bertani medium. Yeast strain CG1945 was grown in yeast extract/peptone/dextrose medium. Five hundred microliters of log-growth phase bacteria or yeast (OD600 = 0.5) were centrifuged and resuspended in 50 μl of PBS supplemented with 1 mg/ml BSA. To kill the bacteria or yeast, the sample was heated to 80°C for 15 min. The live or heat-killed bacteria or yeast was incubated with 0.2 μg of UGRP1-FLAG for 20 min, and then washed with PBS three times. The samples were lysed in 20 μl of SDS-PAGE loading buffer and analyzed by Western blotting with an anti-FLAG mAb. To identify a potential protein homologous to HIN-1 protein, we searched GenBank EST databases. We identified several human EST clones that encode a novel HIN-1-homologous protein, which we designated HIN-2. Because HIN-2 is identical with the recently identified UGRP1 (2), we refer to HIN-2 as UGRP1 below to avoid confusion. Human UGRP1 protein contains 93 aa and shares ∼43% sequence identity with HIN-1 (Fig. 1⇓A). Structural analysis with pSignal software program suggests that UGRP1 contains a putative signal peptide at its N terminus. Cloning and tissue distribution of human UGRP1. A, Sequence alignment of human UGRP1 and HIN-1. The experimentally determined cleavage site (see Results for details) is indicated by the arrow. The signal peptides are underlined. B, Northern blot analysis of human UGRP1 mRNA expression. Human multiple tissue mRNA blots were hybridized with a probe corresponding to the coding sequence of human UGRP1 cDNA. C, In situ hybridization analysis of human UGRP1 expression in normal human lung (a) and the lung from a patient with cystic fibrosis (b). Arrows point to positive cells. A sense control probe did not detect any positive cells (data not shown). Recently, it has been shown that mouse UGRP1 mRNA is predominantly expressed in the lung and is expressed at a low level in the thyroid (2, 3). We examined the tissue distribution of human UGRP1 mRNA expression. 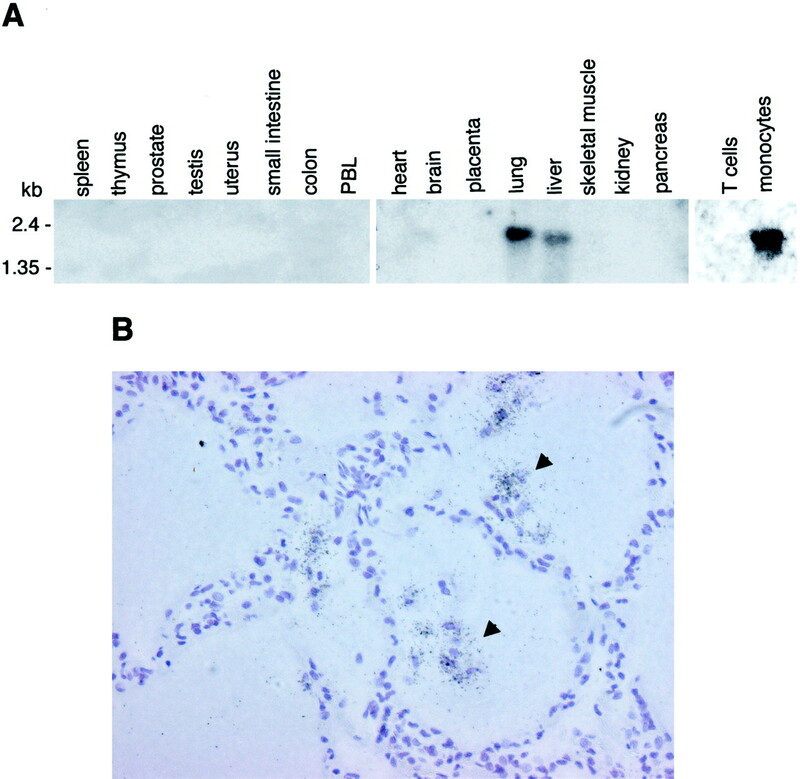 Human UGRP1 mRNA was specifically expressed in the lung as a single ∼0.8-kb band and not detected in other tissues examined, which included the heart, brain, placenta, liver, skeletal muscle, kidney, pancreas, spleen, thymus, prostate, testis, small intestine, ovary, colon, and peripheral blood leukocytes (Fig. 1⇑B). To determine the cell types in the lung that express UGRP1, we performed in situ hybridization experiments. The result suggests that human UGRP1 is specifically expressed by the epithelial cells (Fig. 1⇑Ca). Based on the spatial distribution pattern, the UGRP1-expressing epithelial cells are probably Clara cells of bronchioles. Furthermore, we found that human UGRP1 was up-regulated in the lung epithelial cells of a patient with cystic fibrosis compared with normal lung (Fig. 1⇑Cb). To determine whether human UGRP1 is a secreted protein, we made a mammalian expression plasmid for C-terminal FLAG-tagged UGRP1. This plasmid was transiently transfected into 293 cells, and secretion of UGRP1-FLAG in the cell culture medium was confirmed by Western blot analysis with anti-FLAG Ab (data not shown). To facilitate functional analysis of UGRP1, we purified UGRP1-FLAG from the conditioned medium with an anti-FLAG Ab affinity column. 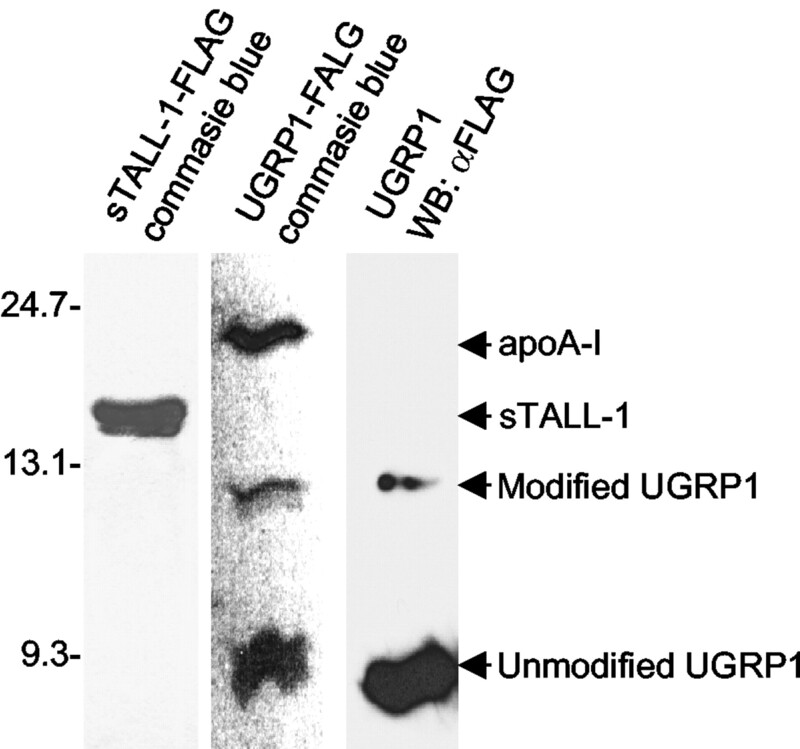 Coomassie blue staining of the purified proteins and Western blot analysis with anti-FLAG Ab suggest that UGRP1 exists as two forms: a ∼9-kDa unmodified form and a ∼13-kDa modified form (Fig. 2⇓). To determine whether the putative N-terminal signal peptide is cleaved and the exact natural cleavage site, we performed N-terminal amino acid sequencing of the two forms of purified UGRP1-FLAG proteins. These experiments suggest that the first amino acid of the secreted UGRP1-FLAG proteins is phenylalanine at amino acid position 22. Our results suggest that the N-terminal 21 aa of UGRP1 is an authentic signal peptide and the mature UGRP1 protein contains aa 22–93 (Fig. 1⇑A). Purification and characterization of recombinant human soluble UGRP1 protein. 293 cells were transfected with expression plasmids for C-terminal FLAG-tagged UGRP1 or sTALL-1. Recombinant UGRP1 or sTALL-1 proteins secreted into conditioned medium were purified by anti-FLAG affinity columns. Aliquots of the purified proteins were fractionated by SDS-PAGE, stained with Coomassie blue (lanes 1 and 2), or analyzed by Western blot with anti-FLAG Ab (lane 3). In the purification experiments, a ∼26-kDa protein consistently copurified with UGRP1-FLAG (Fig. 2⇑). N-terminal amino acid-sequencing analysis indicates that this protein is apolipoprotein A-I (ApoA-I), a major protein component of high density lipoprotein (HDL). Similarly, we expressed and purified HIN-1-FLAG and found that ApoA-I was also copurified with HIN-1-FLAG (data not shown). However, ApoA-I did not copurify with the soluble TNF family member sTALL-1-FLAG under similar conditions, suggesting that ApoA-I is specifically associated with UGRP1 and HIN-1. Because UGRP1 is a secreted protein, we determined whether it binds to cell surface receptor(s). To do this, we incubated UGRP1-FLAG with several cancer cell lines and performed flow cytometry analysis with anti-FLAG Ab. UGRP1-FLAG bound to the plasma membrane of several lung-derived cancer cell lines, including A549, H290, H322, and H292. In the same experiments, UGRP1-FLAG did not bind to monocytic U937 cells (data not shown). These data suggest that membrane receptor(s) exists for UGRP1. To identify the receptor(s) for human UGRP1, we performed expression cloning. Briefly, we transfected ∼5 × 107 of 293–10A1 packaging cells with ∼150 μg of human lung cDNA retroviral expression library plasmid by calcium phosphate precipitation. Forty-eight hours after transfection, the recombinant virus-containing medium was collected to infect ∼5 × 107 of U937 cells, which do not express UGRP1 receptor(s). The infected cells were incubated sequentially with UGRP1-FLAG and a monoclonal anti-FLAG Ab. The UGRP1-FLAG-bound cells were isolated by panning with goat anti-mouse IgG microbeads in a MiniMACS separation column. The isolated cells were amplified and subjected to another round of panning. After two rounds of panning, the majority of cells stained positive with UGRP1-FLAG (Fig. 3⇓A), suggesting that these cells expressed UGRP1 receptor(s). We then performed RT-PCR to recovery the cDNAs in the retroviral vectors integrated into the UGRP1-FLAG-staining positive U937 cells. Two specific bands, 2.1 and 1.2 kb, respectively, were obtained from these experiments (Fig. 3⇓B). DNA-sequencing analysis suggested that these two bands represent cDNAs encoding full-length human MARCO and lung surfactant protein C (SP-C), respectively (Fig. 3⇓B). Expression cloning of human UGRP1 receptor(s). A, Isolation of UGRP1-FLAG-binding positive U937 cells. U937 cells were transduced by a human lung cDNA retroviral expression library. UGRP1-FLAG-binding positive cells were sorted by flow cytometry. The sorted cells and parent cells were amplified and analyzed for their ability to bind to UGRP1-FLAG by flow cytometry. B, Isolation of cDNA inserts from UGRP1-FLAG-binding positive U937 cells. cDNA inserts in the cells were amplified by RT-PCR, and the bands were sequenced. The sequence identities of the bands are indicated at the right. To determine whether MARCO and SP-C are true UGRP1 receptors, we subcloned their full-length cDNAs into the MSCV-IRES-GFP retroviral vector, which contains an IRES element followed by the GFP cDNA. We transduced these vectors into U937 cells by retroviral-mediated gene transfer and sorted the GFP-positive cells. Flow cytometry analysis of the GFP-positive cells with anti-FLAG Ab indicated that UGRP1-FLAG bound to MARCO- but not SP-C-transduced cells (Fig. 4⇓). In these experiments, sTALL-1-FLAG did not bind to either MARCO- or SP-C-transduced cells (data not shown). These data indicate that MARCO, but not SP-C, is a specific receptor for UGRP1. UGRP1 and HIN-1 bind to MARCO. A, UGRP1 binds to MARCO but not SP-C. U937 cells were transduced with MSCV-SP-C-IRES-GFP or MSCV-MARCO-IRES-GFP by retroviral mediated gene transfer. 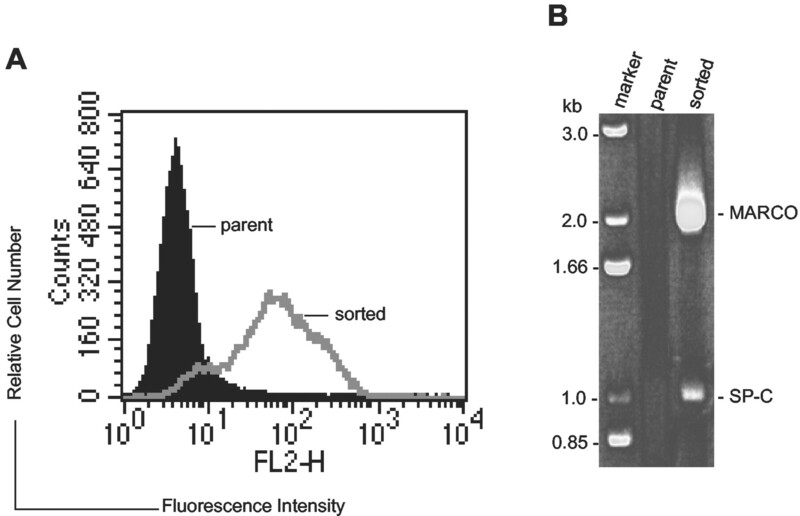 GFP-positive cells were sorted, incubated with UGRP1-FLAG protein or buffer control, and analyzed for their binding to UGRP1-FLAG by flow cytometry with anti-FLAG Ab. B, HIN-1 binds to MARCO. The experiments were performed as in A, except that HIN-1-FLAG was used in the flow cytometry analysis. Because HIN-1 is highly homologous to UGRP1, we determined whether HIN-1 can also bind to MARCO. We transduced MARCO into U937 cells and found that HIN-1-FLAG could bind to MARCO as suggested by flow cytometric analysis with anti-FLAG Ab (Fig. 4⇑). These data suggest that UGRP1 and HIN-1 can bind to the same receptor. It has been reported that mouse MARCO is expressed mostly in subsets of macrophages located in the peritoneum, marginal zone of the spleen, and the medullary cord of lymph nodes (12, 13, 14, 16). Consistent with a previous report (15), we found that human MARCO is expressed at the highest level in lung and liver, and barely detectable in other examined tissues, including the heart, brain, placenta, skeletal muscle, kidney, pancreas, spleen, thymus, prostate, testis, small intestine, ovary, and colon (Fig. 5⇓A). MARCO is also expressed by primary human monocytes but not by T lymphocytes (Fig. 5⇓A). Expression of MARCO. A, Northern blot analysis of MARCO mRNA expression in human tissues and cells. mRNA blots were hybridized with a probe corresponding to the coding sequence of MARCO cDNA. B, In situ hybridization analysis of MARCO expression in normal human lung. Arrows point to positive cells. A sense control probe did not detect any positive cells (data not shown). To determine the cell types in the lung that express MARCO, we performed in situ hybridization experiments. 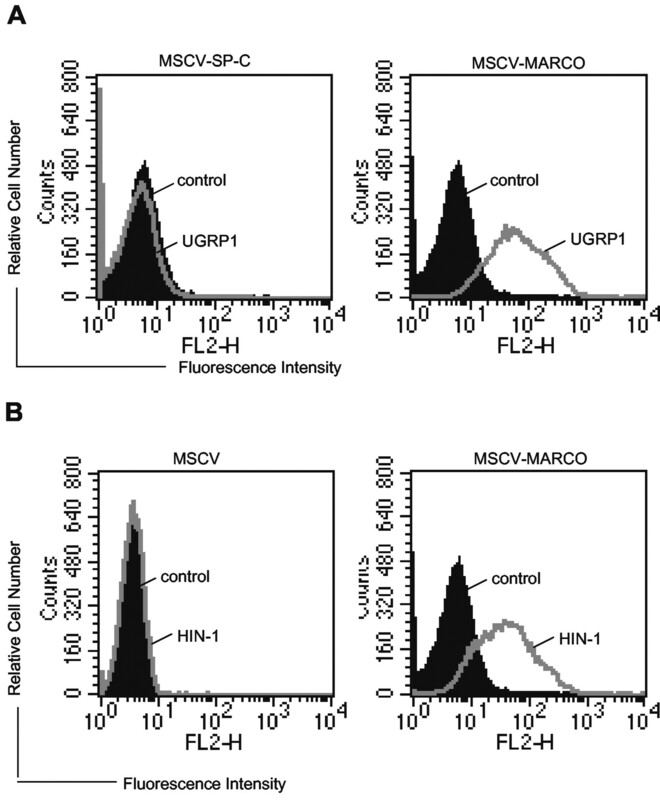 MARCO was detected in alveolar macrophages, but not other cell types (Fig. 5⇑B). Previously, it has been shown that LPS is a ligand for MARCO, and MARCO is involved in clearance of bacteria by binding to bacteria (12, 13, 14, 16). In flow cytometric experiments, we found that LPS could compete with UGRP1 for binding to MARCO (Fig. 6⇓A). UGRP1 binds to LPS, bacteria, and yeast. A, LPS inhibits UGRP1 binding to MARCO. U937 cells transduced with MSCV-MARCO-IRES-GFP, sorted for GFP-positive cells, incubated with UGRP1-FLAG, UGRP1 plus LPS, or buffer control, and stained with anti-FLAG Ab for flow cytometry analysis. B and C, UGRP1, but not sTALL-1, binds to bacteria and yeast. Live or heat-killed yeast (strain CG1945), Gram-positive bacteria (strain L. monocytogenes NP 1.0), and Gram-negative bacteria (strain P. aeruginosa 01) were incubated with UGRP1-FLAG (B) or sTALL-1-FLAG (C) and washed. UGRP1-FLAG or sTALL-1-FLAG protein bound to yeast and bacteria was detected by Western blot analysis with anti-FLAG Ab. D, LPS competes with UGRP1 for binding to bacteria. Heat-killed P. aeruginosa 01 bacteria were incubated with a constant amount of UGRP1-FLAG and increased amounts of LPS. The bacteria were then washed, and bound UGRP1-FLAG was detected by Western blot analysis with anti-FLAG Ab. We then examined whether UGRP1 can bind to bacteria. We used two lung-tropic bacteria strains, the Gram-positive L. monocytogenes NP 1.0 strain and the Gram-negative P. aeruginosa 01 strain. We incubated UGRP1-FLAG protein with live and heat-killed bacteria and then determined whether UGRP1-FLAG binds to bacteria by Western blot analysis with anti-FLAG Ab. The results indicate that UGRP1 binds to both live and heat-killed stains (Fig. 6⇑B). Interestingly, UGRP1 also binds to live or heat-killed yeast strain Y190 (Fig. 6⇑B). In the same experiments, sTALL-1-FLAG did not bind to bacteria or yeast (Fig. 6⇑C), suggesting that the binding of UGRP1 to bacteria and yeast is specific. Because UGRP1 binds to Gram-negative bacteria, we determined whether UGRP1 directly binds to LPS. To test this, we determined whether addition of LPS can block binding of UGRP1 to P. aeruginosa. As shown in Fig. 6⇑C, LPS inhibited UGRP1 binding to P. aeruginosa in a dose-dependent manner, suggesting UGRP1 binds to LPS. UGRP1 can bind to Gram-positive bacteria and yeast, which do not contain LPS, suggesting UGRP1 can also bind to other microbiological substances in addition to LPS. Interestingly, it has been demonstrated previously that MARCO can also bind to Gram-positive bacteria and unopsonized environmental particles. It is possible that UGRP1 and MARCO are involved in host defense against a wide range of microorganisms and other pathogens. In the present study, we identified human UGRP1 and demonstrated that human UGRP1 is specifically expressed by epithelial cells of the bronchioles. Human UGRP1 is a secreted protein, and the mature protein contains aa 22–93. Using expression cloning approach, we identified MARCO as a UGRP1 receptor. In Northern blot and in situ hybridization experiments, we found that MARCO is expressed by alveolar macrophages in the lung, suggesting that UGRP1 and MARCO are involved in functional interaction between epithelial cells of the bronchioles and alveolar macrophages. In flow-cytometric experiments, UGRP1 bound to several lung cancer cell lines, including A549, H290, H322, and H292. Northern blot analysis indicated that these cell lines express MARCO (data not shown), which is consistent with our conclusion that MARCO is a receptor for UGRP1. Currently, we cannot exclude the possibility that UGRP1 also interacts with additional receptors. MARCO is a member of the class A scavenger receptor family (12, 13, 14, 15, 16, 17). The protein contains a short intracellular N-terminal domain, a transmembrane domain, an extracellular region with a short spacer, a collagenous domain, and a C-terminal cysteine-rich domain. Previously, MARCO has been shown to bind to Gram-positive and -negative bacteria and unopsonized environmental dusts and is critically involved in the clearance of these pathogens in vivo (12, 13, 14, 15, 16, 17). Our experiments suggest that UGRP1 can bind to MARCO, and this binding is inhibited by LPS. We also found that UGRP1 can bind to Gram-positive and -negative bacteria and yeast. In addition, our in situ hybridization experiments indicated that UGRP1 is up-regulated in the lung epithelial cells of a patient with cystic fibrosis compared with normal lung. Taken together, these data point to the possibility that UGRP1 acts as an opsonin, and the UGRP1-MARCO ligand-receptor pair is involved in clearance of pathogens in the lung. In our biochemical purification experiments, we found that ApoA-I was copurified with UGRP1. This association is specific, because ApoA-I did not bind to the control sTALL-1-FLAG. ApoA-I is the major component of HDL (21). Interestingly, it has been shown previously that ApoA-I binds to scavenger receptor class B type I, a receptor that belongs to the scavenger receptor family as MARCO does (21). In addition, HDL has been found to neutralize LPS activity in vitro and in animals, including LPS-induced release of proinflammatory cytokine (22, 23). It is possible that UGRP1 is one mediator of HDL-induced regulation of lung inflammation. Our studies also suggest that UGRP1 is up-regulated in the lung of patients with cystic fibrosis, further supporting a role of UGRP1 in the modulation of lung inflammation. The lung epithelium is the first barrier for defense against inhaled pathogens in the lung. The lung epithelial cells secret abundant antimicrobial peptides such as β-defensins and LL37 to kill bacteria (24, 25, 26). Other proteins, such as the uteroglobin/Clara cell secretary protein (CCSP) family members, are also secreted by the airway epithelial cells and abundantly expressed in the lung (27, 28, 29). CCSP is a 16-kDa protein that is secreted by Clara cells of the lung. Gene knockout experiments have shown that CCSP is an important modulator of lung inflammation following infection or injury (27, 29, 30). Interestingly, UGRP1 has ∼25% amino acid sequence identity with CCSP, and both are secreted by Clara-like cells in the lung. It is possible that UGRP1 is functionally related to CCSP. The exact roles of UGRP1 in lung physiological and pathological processes need to be further investigated. Our current study provides an important basis for this future effort. We thank Roberta Pelanda, David Riches, Ed Chan, Philippa Marrack, Terry Potter, and Mike Vasil for advice and discussion, and Shirley Sobus and Bill Townend for help with cell-sorting experiments. ↵1 This work was supported by grants from the National Institutes of Health (R01AI49992 to H.-B.S. ; R01HL029891 and SCOR P01HL067671 to R.J.M. ), the Ellison Medical Foundation, the National Natural Science Foundation of China (39925016 and 30100097), the Chinese High-Technology Program (2001AA221281), and the Special Funds for Major State Basic Research of China (G19990539) to H.-B.S., and a grant from the Environmental Protection Agency (R825702) to R.M. ↵3 Abbreviations used in this paper: HIN, high in normal; EST, expressed sequence tag; UGRP1, uteroglobin-related protein 1; MARCO, macrophage scavenger receptor with collagenous structure; sTALL-1-FLAG, N-terminal FLAG-tagged soluble TALL-1; ApoA-I, apolipoprotein A-I; HDL, high density lipoprotein; SP-C, surfactant protein C; CCSP, Clara cell secretary protein. Krop, I. E., D. Sgroi, D. A. Porter, K. L. Lunetta, R. LeVangie, P. Seth, C. M. Kaelin, E. Rhei, M. Bosenberg, S. Schnitt, et al 2001. HIN-1, a putative cytokine highly expressed in normal but not cancerous mammary epithelial cells. Proc. Natl. Acad. Sci. USA 98:9796. Niimi, T., M. Munakata, C. L. Keck-Waggoner, N. C. Popescu, Y. Zhou, R. C. Levitt, S. Kimura. 2001. UGRP1, a uteroglobin/Clara cell secretory protein-related protein, is a novel lung-enriched downstream target gene for the T/EBP/NKX2.1 homeodomain transcription factor. Mol. Endocrinol. 15:2021. Porter, D., J. Lahti-Domenici, M. Torres-Arzayus, L. Chin, K. Polyyak, K. 2002. Expression of high in normal-1 (HIN-1) and uteroglobin related protein-1 (UGRP1) in adult and developing tissues. Mech. Dev. 114:201. Civitareale, D., R. Lonigro, A. J. Sinclair, R. Di Lauro. 1989. A thyroid-specific nuclear protein essential for tissue-specific expression of the thyroglobulin promoter. EMBO J. 8:2537. Abramowicz, M. J., G. Vassart, D. Christophe. 1992. Functional study of the human thyroid peroxidase gene promoter. Eur. J. Biochem. 203:467. Francis-Lang, H., M. Price, M. Polycarpou-Schwarz, R. Di Lauro. 1992. Cell-type-specific expression of the rat thyroperoxidase promoter indicates common mechanisms for thyroid-specific gene expression. Mol. Cell. Biol. 12:576. Kikkawa, F., F. J. Gonzalez, S. Kimura. 1990. Characterization of a thyroid-specific enhancer located 5.5 kilobase pairs upstream of the human thyroid peroxidase gene. Mol. Cell. Biol. 10:6216. Bruno, M. D., R. J. Bohinski, K. M. Huelsman, J. A. Whitsett, T. R. Korfhagen. 1995. Lung cell-specific expression of the murine surfactant protein A (SP-A) gene is mediated by interactions between the SP-A promoter and thyroid transcription factor-1. J. Biol. Chem. 270:6531. Bohinski, R. J., R. Di Lauro, J. A. Whitsett. 1994. The lung-specific surfactant protein B gene promoter is a target for thyroid transcription factor 1 and hepatocyte nuclear factor 3, indicating common factors for organ-specific gene expression along the foregut axis. Mol. Cell. Biol. 14:5671. Kelly, S. E., C. J. Bachurski, M. S. Burhans, S. W. Glasser. 1996. Transcription of the lung-specific surfactant protein C gene is mediated by thyroid transcription factor 1. J. Biol. Chem. 271:6881. Kimura, S., Y. Hara, T. Pineau, P. Fernandez-Salguero, C. H. Fox, J. M. Ward, F. J. Gonzalez. 1996. The T/ebp null mouse: thyroid-specific enhancer-binding protein is essential for the organogenesis of the thyroid, lung, ventral forebrain, and pituitary. Genes Dev. 10:60. Elomaa, O., M. Kangas, C. Sahlberg, J. Tuukkanen, R. Sormunen, A. Liakka, I. Thesleff, G. Kraal, K. Tryggvason. 1995. Cloning of a novel bacteria-binding receptor structurally related to scavenger receptors and expressed in a subset of macrophages. Cell 80:603. Van der Laan, L. J., M. Kangas, E. A. Dopp, E. Broug-Holub, O. Elomaa, K. Tryggvason, G. Kraal. 1997. Macrophage scavenger receptor MARCO: in vitro and in vivo regulation and involvement in the anti-bacterial host defense. Immunol. Lett. 57:203. Elomaa, O., M. Sankala, T. Pikkarainen, U. Bergmann, A. Tuuttila, A. Raatikainen-Ahokas, H. Sariola, K. Tryggvason. 1998. Structure of the human macrophage MARCO receptor and characterization of its bacteria-binding region. J. Biol. Chem. 273:4530. Palecenda, A., J. Paulauskis, E. A1-Mutairi, A. Imrich, G. Qin, H. Suzuki, T. Kodama, K. Tryggvason, H. Koziel, L. Kobzik. 1999. Role of the scavenger receptor MARCO in alveolar macrophage binding of unopsonized environmental particles. J. Exp. Med. 189:1497. Van der Laan, L. J., E. A. Dopp, R. Haworth, T. Pikkarainen, M. Kangas, O. Elomaa, C. D. Dijkstra, S. Gordon, K. Tryggvason, G. Kraal. 1999. Regulation and functional involvement of macrophage scavenger receptor MARCO in clearance of bacteria in vivo. J. Immunol. 162:939. Elshourbagy, N. A., X. Li, J. Terrett, S. Vanhom, M. S. Gross, J. E. Adamou, K. M. Anderson, C. L. Webb, P. G. Lysko. 2000. Molecular characterization of a human scavenger receptor, human MARCO. Eur. J. Biochem. 267:919. Shu, H. B., H. Johnson. 2000. BCMA is a receptor for the TNF family member TALL-1. Proc. Natl. Acad. Sci. USA 97:9156. Pan, T., L. D. Nielsen, M. J. Allen, K. M. Shannon, J. M. Shannon, M. Selman, R. J. Mason. 2002. Serum SP-D is a marker of lung injury in rats. Am. J. Physiol. 282:L824. Sambrook, J., E. F. Fritch, T. Maniatis. 1989. Molecular Cloning: A Laboratory Manual 2nd Ed. Cold Spring Harbor Lab. Press, Plainview, NY. Silver, D. L., A. R. Tall. 2001. The cellular biology of scavenger receptor class B type I. Curr. Opin. Lipidol. 12:497. Wurfel, M. M., S. T. Kunitake, H. Lichenstein, J. P. Kane, S. D. Wright. 1994. Lipopolysaccharide (LPS)-binding protein is carried on lipoproteins and acts as cofactor in the neutralization of LPS. J. Exp. Med. 180:1025. Pajkrt, D., J. E. Doran, F. Koster, P. G. Lerch, B. Arnet, T. van der Poll, J. W. ten Cate, S. J. H. van Deventer. 1996. Antiinflammatory effects of reconstituted high-density lipoprotein during human endotoxemia. J. Exp. Med. 184:1601. Schonwetter, B. S., E. D. Stolzenberg, M. A. Zasloff. 1995. Epithelial antibiotics induced at sites of inflammation. Science 267:1645. Goldman, M. J., G. M. Anderson, E. D. Stolzenberg, U. P. Kari, M. Zasloff, J. M. Wilson. 1997. Human β-defensin-1 is a salt-sensitive antibiotic in lung that is inactivated in cystic fibrosis. Cell 88:553. Wang, Y., B. Agerberth, A. Lothgren, A. Almstedt, J. Johansson. 1998. Apolipoprotein A-I binds and inhibits the human antibacterial/cytotoxic peptide LL-37. J. Biol. Chem. 273:33115. Stripp, B. R., S. D. Reynolds, C. G. Plopper, I. M. Boe, J. Lund. 2000. Pulmonary phenotype of CCSP/UG deficient mice: a consequence of CCSP deficiency or altered Clara cell function?. Ann. NY Acad. Sci. 923:202. Chang, A., P. Ramsay, B. Zhao, M. Park, S. Magdaleno, M. J. Reardon, S. Welty, F. J. DeMayo. 2000. Physiological regulation of uteroglobin/CCSP expression. Ann. NY Acad. Sci. 923:181. Stripp, B. R., J. Lund, G. W. Mango, K. C. Doyen, C. Johnston, K. Hultenby, M. Nord, J. A. Whitsett. 1996. Clara cell secretory protein: a determinant of PCB bioaccumulation in mammals. Am. J. Physiol. 271:L656. Zhang, Z., G. C. Kundu, C. J. Yuan, J. M. Ward, E. J. Lee, F. DeMayo, H. Wesphal, A. B. Mukherjee. 1997. Severe fibronectin-deposit renal glomerular disease in mice lacking uteroglobin. Science 276:1408.